10.00 to 17.30 from April to September (Monday to Sunday). 9.30 to 17.00 from October to March (Monday to Sunday). The exhibition is closed from 24 to 26 December and opens late (12.00) on 1 January. Visit before 12.00 or after 15.00 to avoid the busy period. We are comparing London Tower Bridge Exhibition Ticket Prices from leading ticket suppliers and Try to find you Cheap tickets prices on the market. Built over a century ago, Tower Bridge has become a much-loved icon and a favourite sight of local Londoners. The famous bridge was originally constructed to ease the flow of traffic but London’s Tower Bridge is far better known for its impressive moving roads. Even in Victorian time, clever London engineers were busy designing what would become one of the most well-known bridges on the world, opening in the middle to allow tall ships to pass through. Inside the exhibition you will even find the original steam engines which were used to open the bridge. A visit to the Tower Bridge Exhibition should be interesting for anyone who wants to visit one of the most iconic landmarks in London. Fun for kids and great the brave individuals who step across the glass floor. The attraction is also good for people who are interested in construction and mechanics. Your Experience With London Tower Bridge Exhibition Ticket? Enjoy the most unique view of the River Thames that you will find in the whole of London. Take a walk on the glass floor suspended above the most famous river in the United Kingdom. 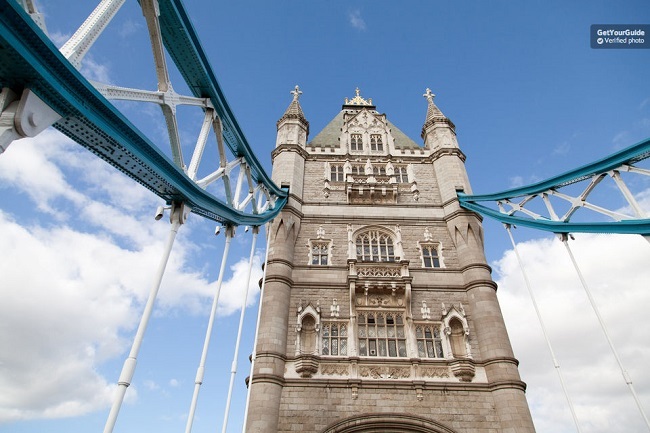 Learn some of London’s long history and the significance of the Tower Bridge. Take a turn back in history as you enter the original Victorian Engine Rooms. Explore this popular London attraction independently and at your own pace without the restrictions of a guided tour. What London Tower Bridge Exhibition Ticket Includes? Entrance fee to the London Tower Bridge Exhibition. We recommend visiting in the early morning when there will be fewer people queuing at the entrance. Travelers Reviews about London Tower Bridge Exhibition Ticket? Travellers have given this attraction a 4.5 out of 5-star overall rating on TripAdvisor. On Get Your Guide the London Tower Bridge Exhibition has a fantastic 4.6 out of 5-star rating. Reviews on both platforms say that the attraction is excellent and that the staff are very helpful. Comments also agree that the exhibition is fun and good value for money. Some travellers also indicate that this is a good attraction to for children to visit, inside the exhibition you can learn how this impressive structure was built and how it operates. The Tower Bridge Exhibition is wheelchair accessible. Your ticket purchase will be confirmed within 48 hours of making your booking. You will need to print your ticket and bring it to the attraction. Depending on your ticket provider your electronic voucher may need to be exchanged for an official entrance ticket at the relevant office. Tickets for this attraction are non-refundable if your plan changes then you will still be charged the full amount of the ticket price. All children under the age of 15 must be accompanied by a responsible adult. There may be a short wait at the entrance due to security checks. Avoid bringing any large bags or sharp objects as these will cause delays. There are photo points along the bridge and in the engine rooms where pictures can be taken without glass. The Exhibition has elevators to all levels of the towers, engine rooms and walkways so wheelchair users can access the entire site. Meeting Point: meet at the entrance to the Tower Bridge Exhibition. Address: Tower Bridge Road, Central London, SE1 2UP, United Kingdom.